Last chance to acquire this fantastic chronograph at the humble price of 3000 Euro. Will not sell Below this price. A rare 37 mm Valjoux 72 racing chronograph in great original/ unpolished condition and perfect working order. This is the same Enicar model racing driver Gerhard Mitter used to wear during his races in the 1960s. Please check "gerhardmitter" on insta. Delivered with a NOS mesh and original Enicar box. 37mm with normal signs of use. The original sunburst finish is still visible. 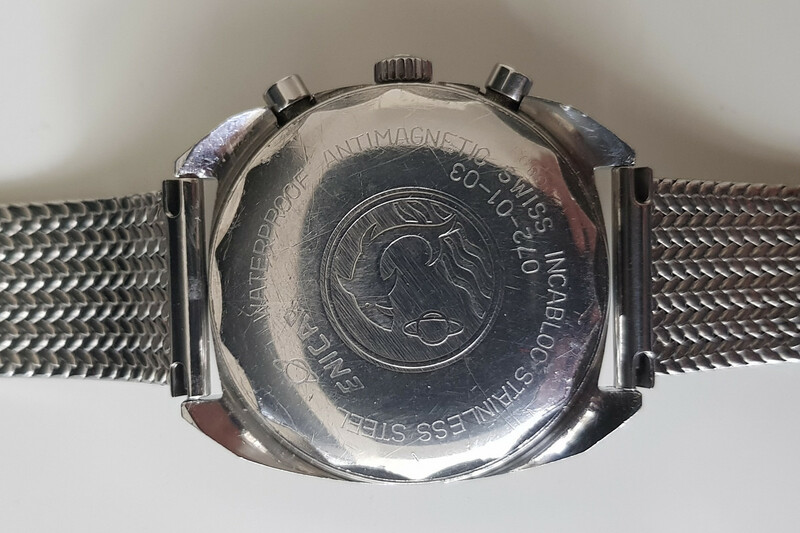 Back case has some scratches but inscriptions (Inner: case number 2342 - outer: model reference 072-01-03) are clearly visible and the dolphine logo is sharp. Original signed crown. 20mm between the lugs. Plexiglas with not cracks. Beautiful matte black with slightly creamy subdials. No scratches or damages. A few of the tiny lume plots have cracked. Raised markers. Black tachy. All hands are original to the watch. The orange sweeping second hands is a nice touch. There is a tiny crack in the lume of the hour hand but not really visible to the naked eye. Very nice patina and no discoloration. Signed valjoux 72 in good condition. Unknown service history but it is clean and in perfect working order. All chrono functions work perfectly and the sweeping second hand resets to 12. A unique opportunity to purchase a beautiful vintage with a legendary movement. Payment via PayPal friends or bank transfer. Mail to lgfnordblom@gmail.com. Amazing Enicar Valjoux 72 "Gerhard Mitter" - 2800 Euro!